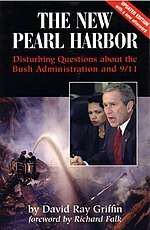 The New Pearl Harbor: Disturbing Questions About the Bush Administration and 9/11 (2004, ISBN 1-56656-552-9) is a book written by David Ray Griffin, a retired professor of philosophy at the Claremont School of Theology. It draws analogies between the September 11, 2001, attacks and the attack on Pearl Harbor in 1941. The title is taken from the 2000 paper "Rebuilding America's Defenses" produced by the Project for the New American Century, which noted that only a "new Pearl Harbor" would enable the military and defense policy transformations the group desired to rapidly take place. The book was included in the official selection of 99 books made available to all members of the 9/11 Commission and was found on Osama Bin Laden's bookshelf during the raid. In the book, Griffin presents pieces of evidence and arguments which he believes support a conclusion that the George W. Bush administration was complicit in the September 11, 2001, attacks, and therefore constituted a false flag incident. The foreword was written by Richard A. Falk, Professor emeritus at Princeton University. Did US Officials have advance information about 9/11? Did US Officials obstruct investigations prior to 9/11? Did US Officials have reasons for allowing 9/11? Did US Officials block captures and investigations after 9/11? Critics of the book argue that many of the claims in the book are easily refuted, and that there are many leaps of logic. Griffin rejects such criticisms and has debated his critics. What's notable about Griffin's take on these events is how easily he leaps to larger evils, a conspiracy at the top. Griffin is a thoughtful, well-informed theologian who before September 11 probably would not have gone anywhere near a conspiracy theory. But the catastrophic failures of that awful day are so implausible and the lies about Iraq so blatant, he feels he has no choice but to recycle some of the wilder conspiracy theories, several of which were popularized by Thierry Meyssan in L'Effroyable Imposture (9/11: The Big Lie), a bestseller in France. Baer adds that Griffin's subtitle, Disturbing Questions About the Bush Administration and 9/11, "suggests this book is a search for truth, but don't let that fool you. His mind is all but made up." ^ "Defense and National Security". Project for the New American Century. Archived from the original on 10 October 2013. ^ "9/11 Commission Materials". www.archives.gov. ^ "Bin Ladin's Bookshelf". www.dni.gov. Retrieved 2015-05-21. ^ Falk, Richard (16 June 2004). "Foreword to "The New Pearl Harbor" written by David Ray Griffin". Transnational Foundation for Peace and Future Research. Archived from the original on 20 January 2012. ^ "The New Pearl Harbor: Disturbing Questions about the Bush Administration and 9/11 by David Ray Griffin Review by Chip Berlet". www.publiceye.org. ^ "Response to Chip Berlet's Review of the New Pearl Harbor". www.publiceye.org. 1 May 2004. ^ "The New Pearl Harbor: A Debate On A New Book That Alleges The Bush Administration Was Behind The 9/11 Attacks". Democracy Now!.